At this point in the evolution of Napa wine country, it’s pretty tough to get a bad meal, provided you’re willing to spend a few bucks. True, there’s a déja-vu-inducing familiarity to the menus, even of recently opened eateries, beginning with designer nuts and olives at the bar, proceeding to retro starters like iceberg wedge with blue cheese and the omnipresent deviled eggs (see, for example, Sam’s Social Club in Calistoga, Rutherford Grill, and Angèle in Napa, which fries its deviled eggs), and followed by carnacentric standards like short rib and roasted chicken for two with sides of mac ’n’ cheese and Brussels sprouts. Well, and why not? American-accented and unpretentious, showcasing homey preparations of locally sourced seasonal ingredients—buttressed by a few dependable imports like NY strip and Hudson Valley foie gras—these hearty and comforting dishes provide the perfect scaffolding for the region’s robust wines. TORC in downtown Napa, open since November of 2013, is a model of how to do this kind of menu up right. Chef/owner Sean O’Toole and his wife Cynthia, who runs the front of the house, are warm and welcoming, and the same is true of the physical place, which formerly was the home of Ubuntu, the Michelin-starred shrine to vegetarianism. It’s a huge room with an open bar and kitchen, and a private dining room on the mezzanine; the surfaces are all wood and stone yet the decibel level is kept to a human scale owing to the soaring ceiling and widely spaced tables. The house style is laid-back but attentive, up-to-date without being precious. Chef O’Toole works variations on the farm-to-table theme, throwing in a few change-ups like his all-truffle menu, featuring exquisite end-of-winter black Perigord truffles variously teamed with diver scallops, porchetta, lobster and foie gras, and pasta. The house-made tagliatelle with parmigiana reggiano, ruby port and black truffles drove us (and our dinner companions) into a feeding frenzy. The preparation was unexpectedly light considering the richness of the ingredients, the salty springiness of the pasta and cheese not at all dominated by the super-generous pile of deep purplish-brown shavings that blanketed the dish: Perigord produces the subtlest of black truffles, and these were softly fragrant and clean-tasting. Conversation at our table abruptly shut down while we shoveled up two platefuls of the stuff in record time. The TORC kitchen also has a winning way with pasta: large pillowy ravioli with wild nettles, ricotta and chanterelles was great on its own and even more so alongside the Hiedler 2014 Grüner Veltliner Thal, the pasta and wine going toe to toe with matching peppery notes. A seasonal risotto was equally impressive for the way its opposing flavors married and intensified one another: garlanded with the season’s first English peas and woody hedgehog mushrooms, the earthy combination was freshened and lifted by touches of mint and pepper and the unexpected zip of Meyer lemon zest. 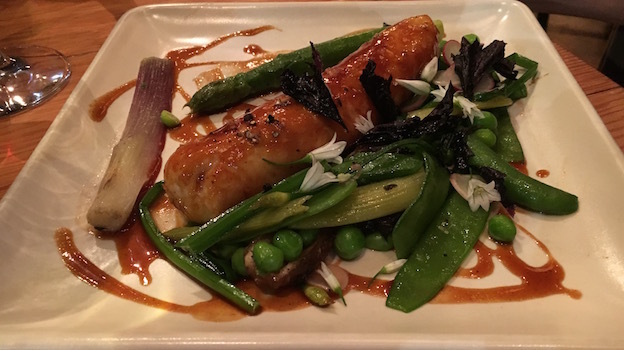 Again, a dish made for Austrian Grüner Veltliner and its vegetal, snap-pea complexity. Along with these starters, we sampled and loved the Hamachi crudo with blood orange and a cool dip of yogurt, as well as the seared foie gras served with citrus marmalade, ruby grapefruit, and an inspired dash of Sichuan peppercorn. Our group reaction: OMG. An entrée of Akoushi beef short ribs was dark and dense, the moist flesh tender without loss of meaty integrity. It was my cue to pour two mature Napa Valley red wines that I had just sampled in a pair of stunning vertical tastings with their makers—results to be published on Vinous later this spring. (TORC charges a per-bottle corkage fee of $25, with one corkage waived if you buy a wine off their list.) 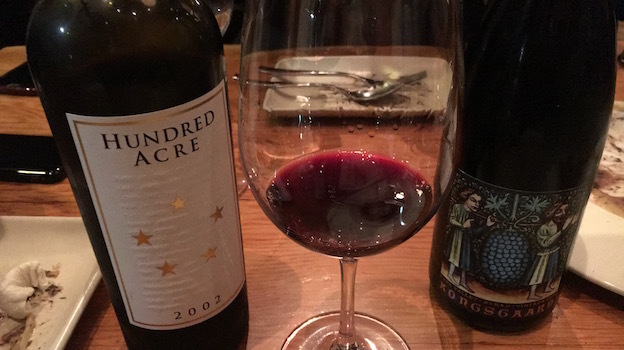 The Hundred Acre 2002 Cabernet Sauvignon Kayli Morgan Vineyard, weighing in at just under 16% alcohol, was hugely ripe, plush and chocolatey but not heavy, offering aromas and flavors of plum, spices, mocha and saddle leather. This classic “winter wine” had enough acidity to buffer its extravagant richness, and its brooding finishing notes of cherry and cooked meat harmonized with the short rib. The Kongsgaard 2004 Syrah Hudson Vineyard, at a mere 15.5% alcohol, made for an even more exciting pairing, beginning with a knockout nose that smelled like wild duck hitting the grill. The smoky game flavors of this large-scaled but bone-dry Syrah were downright Côte Brune-like, and between its meaty bass notes and the saline minerality of its subtle, rising, palate-saturating aftertaste, it managed both to provide a foil for the short rib’s fat and to elevate its sweetness. 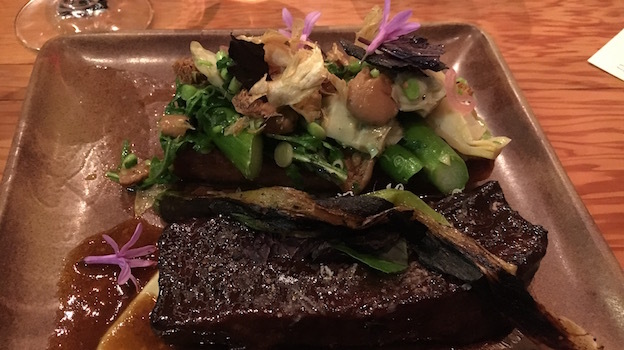 The short rib was accompanied by a crisp medley of spring vegetables, as was the Petrale sole, the latter being the only near-miss in the meal. Local Petrale sole—actually closer to flounder than to sole—is fine-textured, delicate and slightly nutty in taste, and quite sweet. In the house preparation, the thin fillet was rolled and glazed with a tamarind aigre-doux, soy-inflected but more sweet than salty or acidic, the effect seeming to overwhelm rather than complement the dish. Desserts here are salty-sweet, not cloying, and again the dishes are made with an eye towards textural contrast. Vanilla-accented buttermilk panna-cotta comes on a bed of almond crumble with a stack of apple kindling on top: crunchy, crackly, pudding-y. Dark chocolate and hazelnut marquise is a natural with salted caramel ice cream. And Meyer lemon parfait, combining citrus, mint and meringue, provides a bracing finisher. Secure in the knowledge that the Akaushi beef’s relatively high concentration of monounsaturated fatty acids was already reducing my belly fat, I enjoyed them all.